Saturday’s event, hosted by the Indian Harbor Yacht Club, had a two-hour delay with fog along with limited wind. Once the event started, the Bruins jumped ahead and never looked back. In the A-Division, Will George captained for the first six races with Carlos Flores as crew. The duo won the first three races and took second in the fourth race. Following two more races, George moved to crew, as Will Michels skippered the last three races. The new tandem picked up two more first-place finishes and finished second in the final A-Division race of the day. Leyton Borcherding and Chris Ramos were paired for all nine races in the B-Division for the Bruins. 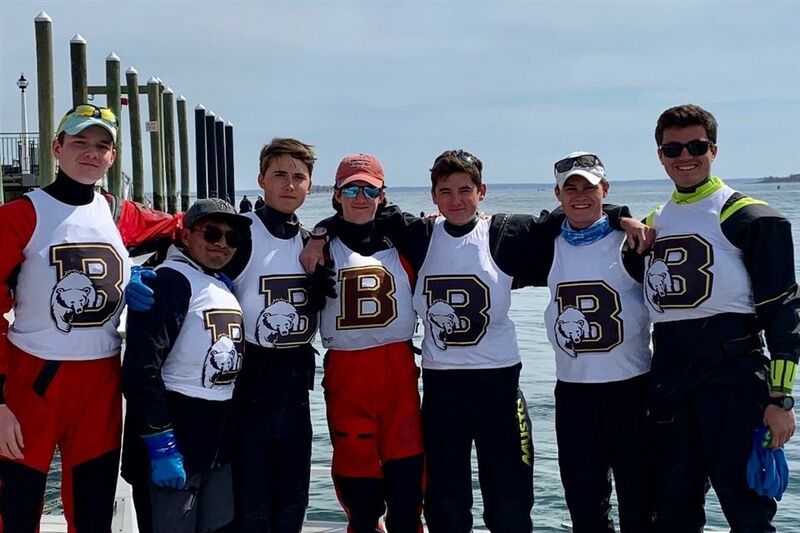 With Borcherding at the helm, the team picked up eight top-three finishes including three wins on the water. Overall, the Bruins collected 40 team points over 18 races, outdistancing second-place Hotchkiss by 17 points. Additionally, in the A-Division, the Bruins out-maneuvered last year’s New England champion from Choate.